A couple of days ago Betty and I motored north out of east Texas up US Highway 259 into McCurtain County, Oklahoma, towards the small town of Idabel. I can recall my oldest living aunt, who would have been born around 1903, talking about that town when I was a kid. I have no recollection of what was specifically discussed, but I suspect the clan inhabited the place or adjacent diggings in the days before they had to flee the country for the searing climes of south-central Arizona. The border between Texas and Oklahoma in that locale is the Red River. North of the river lies Red Slough, a marshy, tree-bedizened terrain pocked with ponds and sumps that before the Anglo settlers showed up and diked and drained would have been a tough place to farm and run cows. As we drove north we spotted a large number of big white birds sitting on the other side of a long, narrow pond. Some of them looked like egrets, but others seemed larger and more…can I use this word to describe birds…authoritarian. The day before, between Tyler and Mount Pleasant, Texas, we had seen what looked to us—or when we first saw them we didn’t know what they were because we’d never seen them—like wood storks. But the books say the storks live further south and blah blah with other stuff bird identification books say. But still, we thought we saw them. But we have thought we have seen rare birds before, only to find out they were something else, and the feeling of having made a rookie mistake forces us to hesitate anytime we think we have a rare bird identified. 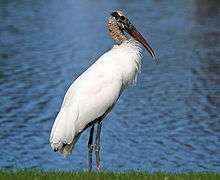 Wood storks are the only storks that breed in the US. They are big white birds with dark heads and big long bills. They stand forty or so inches tall and weight six to seven pounds. They like to hang around in ponds where the water is receding so that as the fish concentrate, the storks can wade in and use their big long dusky yellow bills to capture dinner. South of Idabel I stopped in front of a rundown Oklahoma honky-tonk and turned around and parked in a spot by the side of the pond. A line of bushes partially obscured the birds in question. Across the road, old rusty rakes and swathers and tractors and trucks ganged up around a falling-down barn. We got out and took a good look at the birds. We had our Sibley bird book out and our binoculars that had fogged-up lenses because they were cold from the air conditioner and it was hot and humid outside. We rubbed the moisture from both the lenses and the eyepieces again and again and as we looked up, one of the suspect birds flew in low for a landing and the flight feathers were black, a distinguishing factor in wood stork identification. The big gang standing around in the water sported dark heads and big long dusky yellow beaks just like Sibley says they should if they are indeed wood storks. Given our experiences mis-identifying avian critters, and given the experts saying that the birds hang out further south, I was hesitant to write this blog. The Internet is a terrible thing sometimes, and sometimes it is wonderful. As I type this blog, the Internet is wonderful. This evening I found enough blog posts from local Oklahoma birders to believe that we really did see wood storks. Evidently, they tend to hang out around McCurtain County, Oklahoma. In my memory, my paternal ancestors fled the Texas-Oklahoma-Arkansas region because of murder. Maybe there was a trial and the killer was acquitted, or maybe they hightailed it west with a name change providing just enough curtain to hide them from the law. As I watched those wood storks near Idabel I had the feeling that I was observing something ancient and full of wisdom like judges, but not the local circuit court justices who would have judged my murderous grandfather or one of his killer brothers, but something more in the vein of half-human, half-avian beings that judge the dead as they enter the netherworld. Bird-like thinkers who own a roll call of every deed a man or woman ever did, bad or good, a ledger of sorts, toted up and spit out from the big dusky yellow bill as one passes his/her way into eternity. Maybe Dante was thinking about something like these wonderful storks when he penned those words “Abandon all hope, you who enter here.” Of course the scientists will say they are just birds who cannot think or reason and as such they are incapable of making calculations of any kind. But I am a creative writer and a filmmaker and I say if I can conceive a notion, then I can believe in its possibility. But tonight, here in Memphis, Tennessee, I think maybe I did. Maybe I felt that tug that tethered them until they had to leave in the night and change their names from what…from Banta or something like that…to Rodgers. Part of that tug was the gut feeling with which those big judges with the long dusky yellow bills have netted me, or I have netted myself, or I am so enamored with those birds, and with the land, and its history, that I create my own realities. And of course, maybe I should be more tentative about all this speculation, like I often am when identifying rare birds. “Scientists do not know everything,” said the judge with the long dusky yellow beak and look of know-it-all authority in his stance .